Before we examine what the Bible has to say about the subject of miracles and healings, I would like to begin with a clarification. In this article, we are not questioning whether or not God still heals. Of course God still heals. Everyone believes that God still heals. The question we are seeking to answer is: Are there still healers? - Not, is there still healing? Also, we are not questioning whether or not God can gift people with the ability to heal today. We are questioning whether or not God is gifting people with the ability to heal today. God can do anything He wants anytime He wants. It is not a question of if God can do it, but is God doing it? For example, I believe that God can part the Red Sea anytime He wants, but I haven’t seen him do it lately. So, are there healers today? What does the Bible have to say on this subject? The New Testament (N.T.) records numerous miracles and healings which were performed by Jesus and the apostles. But what was the purpose of those miracles? Did God just decide He wanted to perform a bunch of miracles, or was there more to it than that? According to scripture, those miracles and healings served a specific purpose. The Purpose of N.T. Miracles and Healings was to Confirm God’s Messengers and Their Message. John 10:24-25 Then came the Jews round about him, and said unto him, How long dost thou make us to doubt? If thou be the Christ, tell us plainly. Jesus answered them, I told you, and ye believed not: the works [miracles] that I do in my Father's name, they bear witness of me. So, God wasn’t just randomly performing a bunch of miracles and healings for no reason. Those miracles and healings served a purpose. That purpose was to confirm that His messengers (Christ and the apostles) were sent by God, and that their message was from God Himself. That is why they are often referred to as “sign gifts”. Who Performed these Miracles & Healings? Many in our day have the mistaken notion that all believers in the early church were performing miracles and healing people, but that is not what scripture teaches. 2 Corinthians 12:11-12 I am become a fool in glorying; ye have compelled me: for I ought to have been commended of you: for in nothing am I behind the very chiefest apostles, though I be nothing. Truly the signs of an apostle were wrought among you in all patience, in signs, and wonders, and mighty deeds. 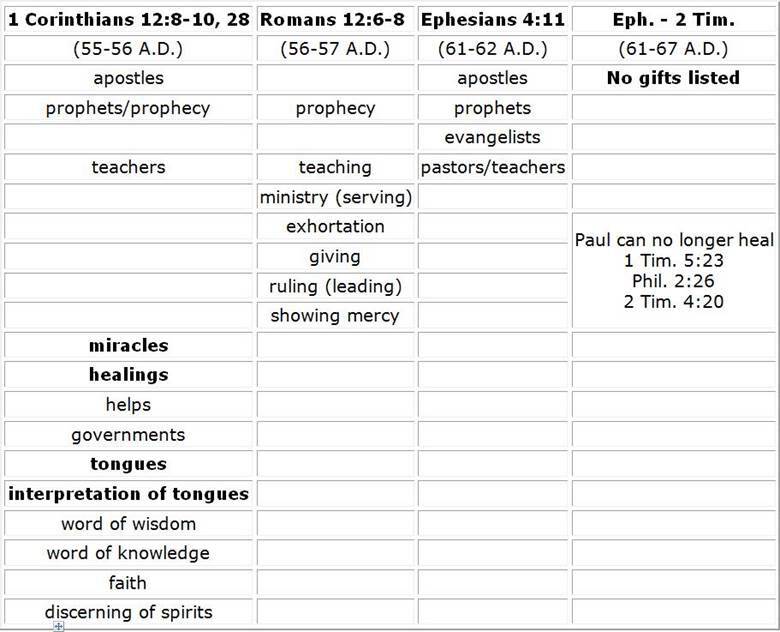 Notice that Paul refers to his ability to heal and perform miracles as "the signs of an apostle". This miracle-working power was given to the apostles to bear witness that they were God’s messengers and that what they were teaching was from God. If every believer had this power, then why did Jesus need to give it to the apostles? They would have had it already. No, these abilities were given to a select few for a specific purpose. There is not one healing performed in the entire N.T. by anyone other than Jesus, the apostles, or those who were directly chosen by Jesus or the apostles. Did the Gift of Healing Pass Away? Did the New Testament gift of healing continue on or was it only temporary in nature? What do the scriptures say? Let’s take a look at the life of Paul (the apostle). In the early days of his ministry, Paul was gifted by God with a tremendous ability to heal. Acts 19:11-12 And God wrought special miracles by the hands of Paul: So that from his body were brought unto the sick handkerchiefs or aprons, and the diseases departed from them, and the evil spirits went out of them. Notice that Paul has such healing power that he didn’t even need to be present for the healing to take place. Simply taking an apron or handkerchief that he had touched and laying it upon a person would heal them. But, what about later on in his ministry? Did Paul still have the ability to heal? 2 Timothy 4:20 Erastus abode at Corinth: but Trophimus have I [Paul] left at Miletum sick. Later on in his ministry Paul no longer had the ability to heal. The gift of healing had passed away, and the very same Paul who had once healed people at will - no longer had the ability. He was instead forced to leave his friend behind sick and travel on without him. 1 Timothy 5:23 Drink no longer water, but use a little wine for thy stomach's sake and thine often infirmities [sicknesses]. Here we see Paul telling Timothy to drink wine for medicinal purposes. The text also says that Timothy was sick often. Why didn’t Paul just heal him or send a handkerchief to lay on him? He couldn’t, because the gift of healing had passed away. Scripture also records that Paul’s friend Epaphroditis was sick. But Paul wasn’t able to heal him either. He instead waited to see if God would have mercy on him and cause him to recover (Phil. 2:25-27). So, according to the teaching of scripture, the gift of healing had already passed away during the early days of the church. On the next page, there is a chart which demonstrates that passing away. 1. Only the earliest list includes any sign gifts (see bold above). 2. Tongues, which were only in the earliest list, were to cease (1 Cor. 13:8). 3. The last reference to a sign gift was around 58 A.D. (Acts 28:9), two years before the end of the book of Acts (Acts 28:30). 4. By the time of his imprisonment (60 A.D.), Paul could no longer heal. 5. By the time of the book of Hebrews (67-69 A.D.), the sign gifts are said to have taken place in the past (Heb. 2:3-4), not the present. 6. Revelation & prophecy ceased with the completion of the N.T. scriptures (1 Cor. 13:9-10, Rev. 22:18). Biblical Healings -VS- Modern "Healings"
When we take a look at true Biblical miracles and healings and compare them to the many “so called” miracles and healings today, we find that they have very little in common. There were 5 characteristics of Biblical miracles and healings. 1. Biblical Miracles and Healings Were Always Immediate. Luke 5:13 And he [Jesus] put forth his hand, and touched him, saying, I will: be thou clean. And immediately the leprosy departed from him. Luke 13:11-13 And, behold, there was a woman which had a spirit of infirmity eighteen years, and was bowed together, and could in no wise lift up herself. And when Jesus saw her, he called her to him, and said unto her, Woman, thou art loosed from thine infirmity. And he laid his hands on her: and immediately she was made straight, and glorified God. In Scripture, we do not see people being healed over a period of time, or get better later on. They were healed immediately. 2. Biblical Miracles and Healings Were Always Successful. Acts 5:15-16 Insomuch that they brought forth the sick into the streets, and laid them on beds and couches, that at the least the shadow of Peter passing by might overshadow some of them. There came also a multitude out of the cities round about unto Jerusalem, bringing sick folks, and them which were vexed with unclean spirits: and they were healed every one. Compare this to modern “healing” crusades. Jesus and the Apostles didn’t send long lines of people home in their wheel chairs. 3. Biblical Miracles and Healings Were Always Complete. Matthew 8:14-15 And when Jesus was come into Peter's house, he saw his wife's mother laid, and sick of a fever. And he touched her hand, and the fever left her: and she arose, and ministered unto them. When people were healed in Scripture, they didn’t just "feel better" or go home and take it easy for a few days. They were healed completely - 100%. 4. Biblical Miracles and Healings Were Always Permanent. Matthew 9:21-22 For she said within herself, If I may but touch his garment, I shall be whole. But Jesus turned him about, and when he saw her, he said, Daughter, be of good comfort; thy faith hath made thee whole. And the woman was made whole from that hour [from that hour on]. In Scripture people did not "lose their healing" through a lack of faith. Once they were healed their symptoms didn’t return. Jesus never told anyone to deny their symptoms for fear that they might “lose their healing”. 5. Biblical Miracles and Healings often Involved Re-Creation. Luke 6:6, 10 And it came to pass also on another sabbath, that he entered into the synagogue and taught: and there was a man whose right hand was withered. And looking round about upon them all, he said unto the man, Stretch forth thy hand. And he did so: and his hand was restored whole as the other. This man was lame from birth and had never walked. Not only did he have bone problems, but he would have had muscle problems as well. Have you ever seen the legs of a person who has been in a wheel chair for a long time? They have no muscles in them. The muscles in their legs would have to be regenerated before they could walk. In the Bible days, when people wore robes, the change in this man’s calves would have been seen immediately. Jesus also healed a man with a withered hand. His hand would have had to have been recreated. Again, this would have been obvious to all who were watching. John 11:39-44 Jesus said, Take ye away the stone. Martha, the sister of him that was dead, saith unto him, Lord, by this time he stinketh: for he hath been dead four days. Jesus saith unto her, Said I not unto thee, that, if thou wouldest believe, thou shouldest see the glory of God? Then they took away the stone from the place where the dead was laid. And Jesus lifted up his eyes, and said, Father, I thank thee that thou hast heard me. And I knew that thou hearest me always: but because of the people which stand by I said it, that they may believe that thou hast sent me. And when he thus had spoken, he cried with a loud voice, Lazarus, come forth. And he that was dead came forth, bound hand and foot with graveclothes: and his face was bound about with a napkin. Jesus saith unto them, Loose him, and let him go. It is easy to deny the works of the so-called healers today. They are often heard about second hand, and the tale seems to grow with the telling. There are researchers, many of them medical doctors, who have tried to verify these so-called miracles. What they find without exception is exaggeration, deception, and even outright fraud. They find absolutely no evidence that any true miracle has actually taken place. Compare that with the miracles and healings of the true apostles. Their miracles were performed out in the open for all to see. No one could deny them or speak a word against them. As we have seen, the time of miracles and healings passed away. But there is something else we need to be aware of. Every single scripture reference to future signs, wonders, and miracles after that time is a warning against false ones that would take place in the latter times to deceive people. Let’s look at some of those scriptures. Notice that these signs and wonders are used to deceive people. Again these miracles are used to deceive people. The powers behind these miracles are devils (evil spirits). Once again, these miracles deceive people. Once again we see that Satan works these “lying” signs and wonders in order to deceive. These signs and wonders are lying for two reasons. 1. They are lies themselves (aren’t true miracles and healings). 2. They bear witness to lies (false doctrine). Earlier in a section labeled “Biblical Healings -VS- Modern ‘Healings’” we saw the stark contrast between true Biblical miracles and the so called “miracles and healings” that take place in our day. Case after case has been documented by researchers of people who were supposedly healed by modern day “healers” who still had the condition they were supposedly healed of. Some of them had even died of the disease they were supposedly healed of before the researchers got to them. One modern day “healer” was challenged by a particular discernment and research ministry to provide the names of the 3 best cases of people who had been supposedly healed at his crusades. When examined, all three people turned out not to have been healed at all. The hosts of T.V. programs have also exposed these “healers” and demonstrated the fact that their so called “healings” never really took place. These facts are readily available for anyone who desires to look into the matter. Earlier, we saw that the purpose of true Biblical miracles and healings was to confirm that God’s messengers (Christ and the apostles) were sent by God, and that what they were teaching was the truth from God Himself. These lying signs and wonders do just the opposite. They are used to back up the lies of false teachers who are deceiving people. In our day, there are many who hold great "healing crusades" but who teach outright heresy. Would God give these people healing power to back up such false doctrine? No. God's true miracles and healings were always used to bear witness to the truth (Mark 16:20; Hebrews 2:3-4; etc.). Are we to suppose that "all" of the supposed “miracles and healings” taking place today are of God? If so, then where are Satan’s lying ones? As we saw earlier, every single reference in the entire N.T. to signs, wonders and miracles in the latter times is a warning about false ones that would deceive people. People need to take heed. In this article, we have learned the following from scripture about miracles and healings. 1. The purpose of Biblical miracles and healings was to bear witness to (confirm) the truthfulness of God’s word being taught by Christ and the apostles. But modern day so called “miracles and healings” bear witness to false doctrine (lies) being taught by false teachers. 2. There is not one healing performed in the entire N.T. by anyone other than Jesus, the apostles, or those who were directly chosen by Jesus or the apostles. But today people are being misled into believing that all believers can perform miracles and healings if they will just have enough faith. 3. The gift of healing was only temporary and passed away before the N.T. scriptures were completed. 4. Biblical miracles and healings were always successful, immediate, complete, permanent, and often involved re-creation. But modern day “miracles and healings” are often unsuccessful, or a process, or incomplete, or temporary, and don’t involve re-creation. 8. Every single reference in the entire N.T. to signs, wonders and miracles in the latter times is a warning about false ones that would deceive people. Have you been deceived by them? Will you believe what the scriptures say about miracles and healings?